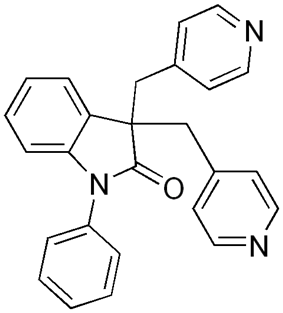 Linopirdine is a putative cognition-enhancing drug with a novel mechanism of action. Linopirdine blocks the KCNQ2\3 heteromer M current with an IC50 of 2.4nM disinhibiting acetylcholine release, and increasing hippocampal CA3-schaffer collateral mediated glutamate release onto CA1 pyramidal neurons. In a murine model linopirdine is able to nearly completely reverse the senescence-related decline in cortical c-FOS, an effect which is blocked by atropine and MK-801, suggesting Linopirdine can compensate for the age related decline in acetylcholine release. Linopirdine also blocks homomeric KCNQ1 and KCNQ4 voltage gated potassium channels which contribute to vascular tone with substantially less selectivity than KCNQ2/3. ^ a b Schnee, M. E.; Brown, B. S. (1998). "Selectivity of linopirdine (DuP 996), a neurotransmitter release enhancer, in blocking voltage-dependent and calcium-activated potassium currents in hippocampal neurons". The Journal of pharmacology and experimental therapeutics 286 (2): 709–717. ^ Sun, J.; Kapur, J. (2012). "M-type potassium channels modulate Schaffer collateral-CA1 glutamatergic synaptic transmission". The Journal of Physiology 590 (16): 3953–3964. ^ Dent, G. W.; Rule, B. L.; Zhan, Y.; Grzanna, R. (2001). "The acetylcholine release enhancer linopirdine induces Fos in neocortex of aged rats". Neurobiology of aging 22 (3): 485–494. ^ Bryant, W. M.; Huhn, G. F.; Jensen, J. H.; Pierce, M. E.; Stammbach, C. (1993). "A Large Scale Preparation of the Cognitive Enhancer Linopirdine". Synthetic Communications 23 (11): 1617.